You all know how I feel about packets in my pantry, so Muesli bars is one recipe I have worked hard on perfecting as I eat them often and refuse to buy them. Below is my own Homemade Muesli Bars Recipe which some of you have tried at various events I have held. I have basically modified a number of recipes to make one that works for me!! 1. Dry toast all the seeds, rolled oats, wheatgerm and the coconut in a hot pan stirring constantly for about 5 minutes. I have a thermomix so I use this and dry toast them on Veroma Temp, speed 4, reverse for 5 mins. 2. As I am using a thermomix I then blitz my seeds for a couple of seconds to chop them up a bit, it works fine without doing this so if you don’t have a thermo mix don’t worry, otherwise try it in a food processor if you have one. 4. Heat the butter and honey for about 5 minutes until boiling and stir constantly, or if using a thermomix speed 4, veroma, 5 mins. 6. Press into a lined 22cm cake tin and refrigerate for at least 4 hours but over night is better. 7. Once set cut into bars or squares. Toddler Tip: if I’m making a batch for my 3yr old, I add only 20 grams of sunflower seeds and 20 grams of pepitas and add 80 grams of my sons favourite cereal (usually Nutrigrain) then also blitz it for a bit longer so its not so chunky for him. 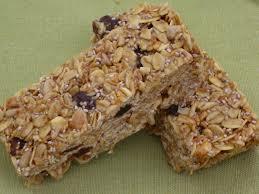 So throw away your packets and try these Homemade Muesli Bars, its easy and the whole family can enjoy it.